Travel with LendAHand Mission Teams to teach at two conferences in Nicaragua, April 18th-27th. The first stop will be Quilalí, the focus of our first Sacred Treasure House Initiative. The pastors' study books have been ordered, should be delivered in four weeks (keep praying!) and I will have the happy privilege of presenting the books and teaching the pastors how to use them. Then on June 6th, Denise and I will start the long two-day drive to Iowa. I'll serve as the Iowa Holiness Association Camp Meeting Bible teacher for a week, and then we'll drive back, probably arriving home the last day of Spring — June 20th. Somewhere towards the end of the Guatemala visit, I'll turn 66, but — guess what? They don't cut old guys any slack or change the rules in the Kingdom Olympics, so I intend to nap the entire month of July. Not! I'll be back in training for the next “event” by the end of June. A group of Honuduran elephant eaters! Gracias a Dios usted ha sido un impulso para muchos en honduras a través de su esmero en enseñarnos, ahora tenemos muchos hermanos leyendo las escrituras y esto ha sido muy motivante para mí como pastor y obispo de honduras. Le estoy muy agradecido por su apoyo. Thank God, you have been an impetus for many in Honduras through your diligence in teaching us. Now we have many brothers and sisters reading the Scriptures, and this has been very motivating for me as pastor and bishop [superintendent] of Honduras. I am very grateful for your help. …que bendición saber que pronto con la ayuda de Dios lo tendremos aqui en tegucigalpa Honduras en mi zona. Dejó una muy buena motivacion en los participantes y para mi. Fue un exelente tiempo…. Gracias a Dios por las personas que estan apoyando su ministerio para darnos a conocer cosas profundas de la Biblia. Es motivante ver el despertar de lideres atraves de la enseñanza. Dios lo use mas y mas y que Dios bendiga su vida y su familia y las personas de buen corazon que apoyan su exelente ministerio. lo esperamos con brazos abiertos de todo corazon. …what a blessing to know that soon with God's help we will have you again in Tegucigalpa, Honduras, in my area. You left a very good motivation in [last year's] participants and with me. It was an excellent time…. Thank God for the people who are helping your ministry in order to give us the deep things of the Bible. It's motivating to see the awakening of the leaders through the teaching. God use you more and more, and may God bless you and your family and the good-hearted people who help your excellent ministry. We await you with open arms with all of our heart. You can thank the Hondurans for the sports theme of this newsletter. 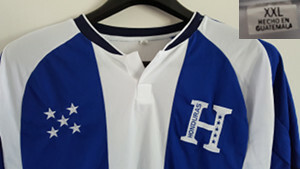 Last year they bought this Team Honduras shirt for me. It's a lovely gift (but I couldn't help pointing out to them the tag that says, “Hecho in Guatemala” ;-D). I'll take that as a “gold” for the Kingdom of God on the last visit. But I hope you caught that last part — Ángel (who has lived in the United States, on and off) and Javier both know that even an “olympian” is just the “tip of the iceberg” of a much larger support group of self-sacrificing family, friends, coaches, teammates, contributors, and sponsors. They are thanking God for YOU, those of you who pray, those of you who contribute “creamy peanut butter” (to our General Fund — remember last month's newsletter?) 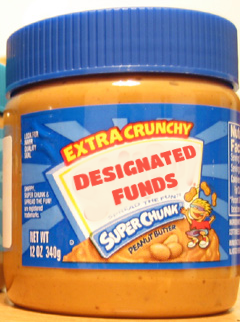 and those of you who are moved to contribute “crunchy peanut butter” (to fund specific missions trips and projects). What? You didn't read last month's newsletter? We have one new “creamy peanut butter” contributor confirmed from Virginia, another apparent one from out West, and a pending one from the Land of Stetson hats. That's a praise report! $1,036.80 for round-trip coach air fare to San Pedro Sula, Honduras. ~$600 to share with translators, and to help with gasoline and meals while in Honduras. $1,750 exactly for all expenses related to next month's Nicaragua trip. $782.61 (best price today) for round-trip coach air fare to Guatemala City in May. Pray like it matters (because it does! 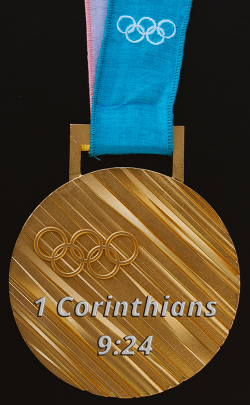 ), give sacrificially to the Lord, and be certain our “team” is represented at these upcoming “events.” To compete, we have to show up at the “starting line,” and that means a supply for “leg room — what's that?” coach air fare. You'll be doing your part to help raise up other “athletes” in Latin America. If I can adapt the words of Jesus, please give “so that he that goeth and he that sendeth may rejoice together” (John 4:36). You've read how they are already applauding “Team Finest” in Honduras. I expect loud cheering when the books are delivered in Nicaragua. The cloud of witnesses has already filled the stadium in anticipation, and Jesus is in the royal viewing box (Hebrews 12:1-2). The starter's gun for the beginning of my Spring Olympics will fire off this coming weekend in Yoro, Honduras. Let's “go for the gold”! Photo credits: Pre-modified peanut-butter-jar images: Wikipedia; pre-modified Olympic medal: Charles Diluvio on unsplash.com; Hebrew scroll: photografier, 123rf.com; other image modifications and “elephant eaters” photo: Jim Kerwin. All used by license or permission. What is the acceptable year of the Lord? If you've made it this far in the newsletter, you deserve to know that we have a bonus teaching article this month on the website. 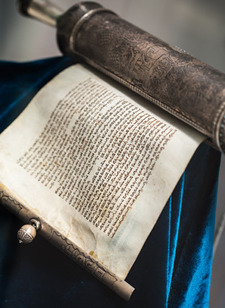 Understanding Jesus' first teaching session (recorded in Luke 4:16-21) hinges on understanding what is meant by the central phrase of His Messianic proclamation — “the acceptable year of the Lord.” It's all laid out to expand your mind and thrill your heart in Jesus' First Sermon. We'd appreciate it if you'd leave your feedback on the page or share it on social media if you find it helpful!